A barrage of four rockets was fired from Gaza toward Ashdod at around noon Saturday. 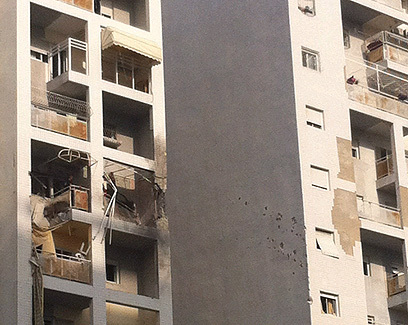 One of the rockets struck a building in the city and two others landed in a residential area. A number of people suffered from anxiety. The fourth projectile did not cause any injury but damaged a vehicle. 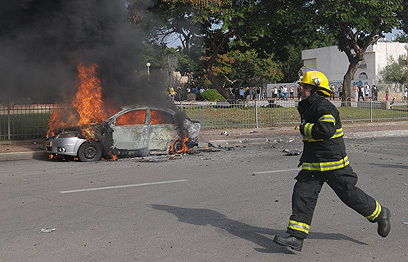 Channel 2 said four people sustained light wounds during the attack on Ashdod. They were evacuated to the Kaplan Medical Center in Rehovot. Roughly 15 minutes after the direct hit on the building the Iron Dome missile defense system intercepted another four-rocket salvo that was fired toward Ashdod. A short while later another rocket launched by Palestinian terrorists hit a house located in the Negev's Eshkol Regional Council. The house was empty at the time of the attack. A barrage of five rockets was fired from Gaza toward Beersheba, all exploding in open areas. Four rockets fired toward Be'er Tuvia were intercepted. Earlier on Saturday, four soldiers sustained light injuries when a mortar landed in the Eshkol Regional Council. More than 60 rockets were fired toward Israel on Saturday after the Israeli aircraft leveled the Hamas government building in Gaza City. The IDF has attacked more than 200 terror targets throughout Gaza since 6 pm Wednesday. The targets included 120 rocket launchers and more than 20 smuggling tunnels in Rafah. 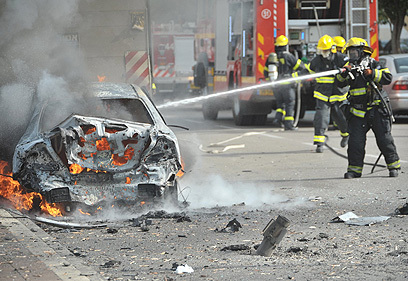 Saturday morning saw the Israeli Air Force attack a terror cell as it was preparing to fire rockets toward Beersheba. Three terrorists were hit. Also on Saturday, Israeli aircraft killed a Hamas officer who was in charge of air defense in Gaza. Palestinian sources in Gaza reported Saturday that the IDF attacked a motorcyclist in Khan Younis. They said one Palestinian was killed in the attack. Later it was reported that three people were killed in an Israeli strike east of the al-Maghazi refugee camp. In addition, three people were killed in an IDF strike in the al-Zahour neighborhood, located west of Rafah in the southern part of the coastal enclave. Another Palestinian was killed and three others were wounded in an IDF strike in Deir al-Balah. According to the report, another person was killed in an attack on a terror cell in Rafah's al-Sulan neighborhood. More than 830 terror targets have been attacked in Gaza since the IDF launched Operation Pillar of Defense on Wednesday. Since the beginning of Operation Pillar of Defense, Gaza terrorists have fired 703 rockets towards Israel, with only 27 projectiles, or 4%, landing in urban areas. The Iron Dome has intercepted 217 of the rockets. See all talkbacks "Direct hits on Ashdod building, Eshkol house"